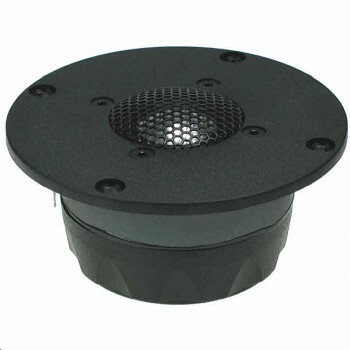 Seas 27TBC/G H1147-06 Tweeter is a High Definition metal dome tweeter with a wide, soft polymer surround and a rear chamber, with a Aluminum/Magnesium alloy diaphragm. A Hexagrid protects the diaphragm. No Ferrofuid. Seas 27TBC/G H1147-06 Tweeter is a High Definition metal dome tweeter with a wide, soft polymer surround and a rear chamber, with a Aluminum/Magnesium alloy diaphragm. A Hexagrid protects the diaphragm, and supports a phase plate which compensates for a slight axial roll off towards 20 kHz. A Sonomax surround is used for low resonance and excellent linearity. Aluminium Voice coil winding. No Ferrofluid.